Here they are! 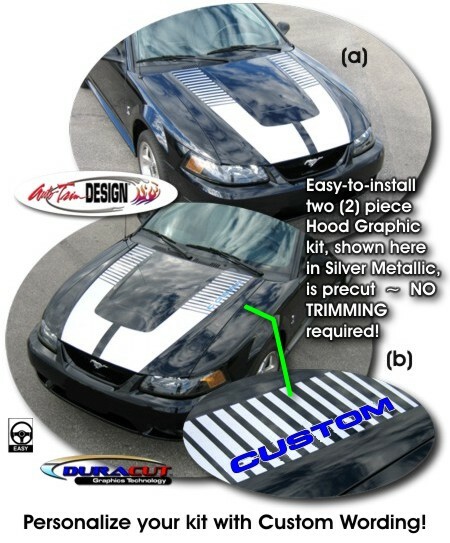 Custom fit Rally Hood Graphics that fit perfectly on your '99-'04 Cobra factory hood. Available in a wide variety of colors, they'll dress up your ride for the Street or Strip. Choose from stripes with no badging or customize the kit with unique wording. Simply enter the Custom Wording of your choice (up to seven  letters/digits/spaces) and we'll make it happen. Either way, they'll look Terrific! These graphics are precut (no trimming required) and very easy to install.